Save the Date 19th March, for our Chester & Cheshire Wedding Fayre at the Brook Mollington Banastre Hotel & Spa! <3Save the Date for our Cheshire & Chester Wedding Fayre! <3<3..
We at Red Event are so excited to be holding a Wedding Fayre at The Brook Mollington Banastre Hotel & Spa on Sunday 19th March 2017, 12 - 4pm. Join us and over 30+ of the regions professional wedding specialist across 4 rooms for a glass of bubbly, canapés, catwalk shows, live music, advice on all your wedding ideas, a huge designer bridal dress sale by Opulence Bridal and an afternoon of wedding planning and shopping... all for FREE!! We will have two fantastic catwalk shows at 1:30pm & 3pm showcase Bridal Wear by The Wedding Collection and Menswear by Groom Chester! Not booked your wedding venue yet? Look no further as the friendly and accommodating wedding team at the Brook Mollington will be on hand to show you their Function Suites, Bridal Suites, Spa and stunning garden area perfect for your picture perfect wedding! Book your wedding at the Brook Mollington on the day of our wedding fayre or by the end of March and receive 10% off your wedding inclusive package and a £500 bar tab for weddings in 2017. For 2018 weddings 10% off wedding inclusive package! Wow! Just another reason to come to our wedding fayre! Wowza, so what are you waiting for? Put the date in your diary and visit our event page here for more information about the fayre and to pre register for your FREE ticket and join us for an afternoon of Wedding Shopping & Planning! Winners will be drawn during our catwalk shows at 1:30pm & 3pm. *You can Pre Register for this event or just turn up on the day! Either way it is free entry! Strike a pose!! Our models on the canal bridge outside of the Holiday Inn Ellesmere Port. Groom wears suit from Greenwoods Menswear, Bridal & Bridesmaid dress from Elegance Bridal. Hair by Claire Kendrick and make up by DW Make Up and Bellissimo. Jewellery by Rojers Jewellery. Bouquets by Katie's Floral Creations. Bridal Box Studios specialise in venue dressing, bridal bouquets, wedding flowers, buttonholes, centre-pieces and stationary what more could you ask for? Our models enjoying a photoshoot in the Manfred Suite! Groom wears suit from Greenwoods Menswear, Bridal dresses from Elegance Bridal. Hair and Make Up by Claire Kendrick, Bellissimo and Make Up by Bellissimo and DW Make Up. Jewellery by Rojers Jewellery and flowers by Katie's Floral Creations. Stood by Lisa Jane Wedding Collection LOVE letters and signs for weddings. Astin Martin by Key Hole Motors parked outside the Holiday Inn Ellesmere Port/Cheshire Oaks perfect for the arrival of the Groom to be! Beautiful model Hayley on our catwalk show wearing a dress from Elegance Bridal , hair by Claire Kendrick and Make Up by DW Make Up. We just loved the vintage veil! Carol Anne's Florist exhibited with lots of Autumn floral designs & bouquets. Gorgeous Molly looking pretty in purple wearing a bridesmaid dress by Elegance Bridal, bouquet by Katie's Floral Creations. Hair by and make up by Bellissimo. A selection of items that Lisa Jane Wedding Collection offers for your big day. Our model Nikki wearing a dress by Elegance Bridal, hair by Claire Kendrick and make up by DW Make Up. Bouquet by Katie's Floral Creations, backdrop by Covers & Bows Venue Dressing. Treat your guests with sweets and candy buffets from the Party and Balloon! A bride & groom chatting with Rojers Jewellery getting that all important advice for choosing the perfect wedding ring and jewellery for your big day! Still Deciding On Favours For Your Guests? Look No Further Than Claire House! You can choose from seeds, pins, tokens and place cards to support your charity and give something back on your big day! Claire House is a charity that everyone knows and recognises. Charity Wedding Favours are increasing in popularity and they a good way to give something back on your big day! 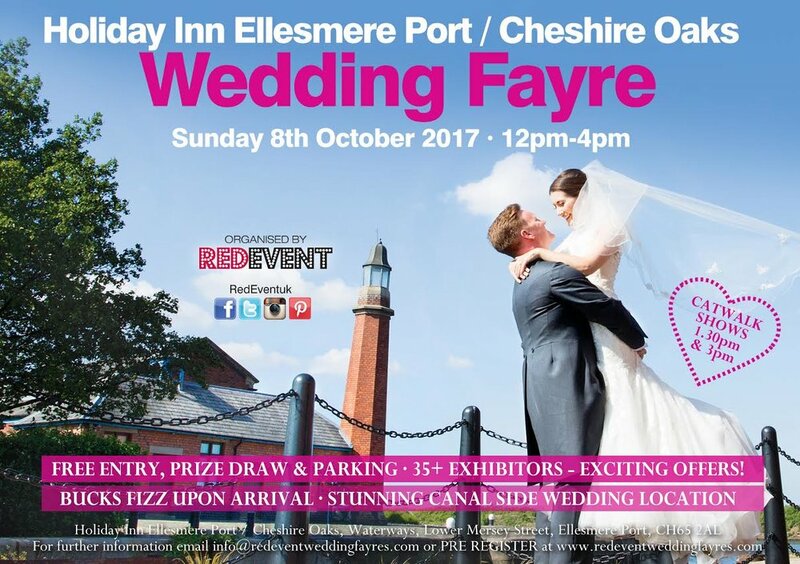 If you are looking for your Wedding Favours or you are just looking for more Wedding Inspiration or Wedding Ideas, come along to our popular Chester Wedding Fayre, this Sunday 12-4pm at the stunning Brook Mollington Banastre Hotel and Spa!